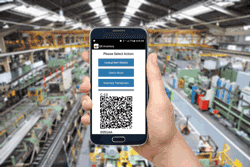 QR Inventory will help you effectively track and manage work tools in the field, tool crib, construction sites and warehouse without purchasing expensive inventory tracking hardware. Use regular smartphones to check tools in and out, verify employee status before issuing a work tool, enter required information, take photos and collect signatures. Access tools real time location and transactions history from anywhere. Keep track of tools warranty expiration and maintenance. Easy tools check in, check out on site with a smartphone. Use barcode, QR code, NFC or RFID tags scanning. Track work tools and equipment anywhere (in the field, tool cribs, construction sites, warehouse, etc.) using regular smartphones. Use smartphones for QR code / barcode / NFC scanning, mobile data collection and look up. Use RFID reader connected to a smartphone for RFID tags scanning. Record all tools transactions in real time: tools check in, check out, sending tools to repair, return, calibration and maintenance, etc. Use smartphones to take photos for visual documentation and collecting signatures. Upload list of employees and verify employee status before issuing a tool. Make sure your work tools are accounted for, are not misplaced or lost. Tools information submitted in the field via the smartphones is saved in a secure cloud, and is available to authorized users in real time anywhere. Always know where your tools are, who is using them, on what site and for which project. Keep track of tools check in, receive an alert if tool is not checked in on time. Access tools lifetime history: usage, repairs, maintenance, etc. via admin web dashboard. Use smartphones and custom mobile forms to record work tools calibration, maintenance and repairs. Eliminate physical paperwork related to the work tools. Keep tools digital records in order, access them on demand from anywhere. Use multiple search filters to find required information fast. Set custom reminders to make sure you never miss scheduled tool maintenance. Set alerts on other important events, such as warranty expiration. Keep track of individual tools by serial number, and manage tools inventory. Use serialized tools and equipment information to track life-cycle history of each individual tool. Access total inventory of the specific tool type (e.g. power drill), check how many are out in the field and how many you have on hand for check out. Set alerts and receive automatic e-mail when tools inventory falls below minimum quantity and you need to order more. Reserve tools for the jobs and projects Make sure that you have adequate tools supply for all future jobs. Reserve tools for the specific jobs or projects, and QR Inventory will ensure that employees can not check out tools that will be needed for the future project(s). Check if enough tools are available for the upcoming reservations, and if not - what is missing.